Thread: Lost on this quilt. We are all very critical of our own work. When this happens to me, I just bite the bullet.. do it and then forget about it, moving on to the next one. I have found that if I put a quilt top away and don't look at it for a week or so that it looks better the next time I look at it. I'll think..."Well, that doesn't look as bad as I remembered..." Might work for you. I have one I started last weekend and after making several blocks decided it was UGLY and it went in the closet to be looked again when I am in a different frame of mind and either thrown out or resurrected. Can you post a picture? I love tumbling blocks and am wondering if it just the colors you selected? When I made my floating cube quilt I threw out many blocks because I just did not like the effect or lack there of when I finished it. So don't despair it may be savable! If I'm making a quilt for someone - I try not to interject my like or dislike of the quilt and just do the best job I can. The recipient is always thrilled - even though I didn't care for the quilt. I am a newer quilter and only done bed quilts for my younger children so this hasn't happened (yet, though I'm very critical of my work so I bet it'll happen in the future). I just wanted to give you a ((((HUG))))) I'm sure it will be well loved quilt no matter what!! I'm sure it looks amazing!!! Post a picture. Maybe we can help you figure out how to make it more so you like it too! If you are very close to your granddaughter, show it to her and ask her how SHE would change it. Odds are, she won't want you to change anything, because it came from you. If it's a problem with spending time quilting it, send it out to someone else to quilt, so your DGD will get a chance to enjoy it. 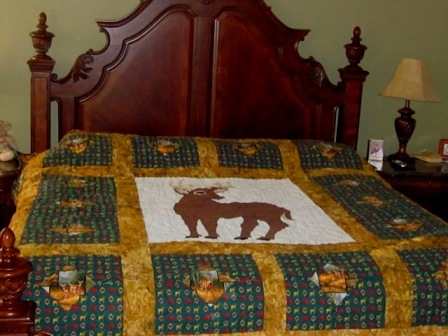 Besides, the quilting will probably it look better. So far, I am lucky enough that every quilt I have made had turned out better than I hoped, after it was quilted; any mistakes seem to "disappear", and the quilting just brings it all together. Remember, this is a quilt your DGD requested, and it was made with love by you. She will love it, and that's all that really counts. I would give it to her as a hug blanket. Then when you have a space make one you love. so right HillCountrygal. I say that all the time bite the bullet and just do it. It is not easy when we don't like our own creations. Not every song starts out perfect, not every painting is a masterpiece, what they are is filled with love and care. Make a list of the actual things you don't like and the things you like. Set aside the emotion of the piece and review it like someone else made it then decide if what you think is bad really is. Many times a quilt doesn't like me but loves the person it was given to. I agree with the comments of the ladies on this board. I am sure it is not as bad as you think. If you were to post a picture, you would get some hints from these wonderful ladies. Here is one I finished for one of our Managers at work. She had done the inner panel and had all the material (which I didn't like the fabric print). She wanted me to finish it as she had started it some 12 years ago and never finished. She loved it but I thought it was horrid. I added the gold batik to offset the dark emerald green with the tiny red and gold deer material she furnished. Beauty is in the eye of the beholder. My manager beholded (or beheld LOL) it with different eyes than I did. Bingo!! Works wonders. There is appliqué in the quilt I am working on. I really did not feel it was "good enough". Stopping and working on another for a bit, went back to the appliqué, DANG, it looks lovely and I would not change a thing!! That's what happens!! Makes life fun.. Lots of times these turn out great when they are finished.. When I find myself having problems liking what I'm making, I put it aside and start/finish another project. Then, when I'm in a better state of mind I pull the "difficult" quilt back out and continue. I was asked to make a scrap quilt by a friend who had sewn strips of fabric together in about 10-12" strips, but wanted red for the sashing. Now, I like red, in moderation, however, I was having trouble. Then I remembered seeing a quilt teacher on Simply Quilts who treated red as a neutral. I finished the quilt by telling myself "red is a neutral, red is a neutral" and it worked. I haven't had this happen to me. I can't imagine working with some colors - or a modern look. I wouldn't mind knowing what a person favorite color was, or what their tastes were, but in the end I think I would need to pick the fabric and design I would feel good about. After all I am the "artist". Of course one time I was looking at a bride's gift registry and would not, could not buy the black china she picked, had to go to other items. Just want to feel good about giving, maybe? I have a quilt that I have been waiting to finish since 2004 and now don't like the way the borders are and it's time to do the binding. I think I am just going to go for it and let it go as a learning experience since I didn't measure for the borders the correct way. This is what I do too. I started a "purple" quilt for my great granddaughter. It is a Hidden Wells pattern and I don't have enough contrast (not enough lights). However, I put the pieces up on my design wall, took a photo and sent it to my daughter to show to my DGGD. Needless to say, my DGGD said that it was, "Even more beautiful than I imagined." Bless her sweet little heart. It is growing on me and I am bound and determined to finish it. I think that sometimes we forget what it is like to get something from "our grandma" and how much that means. I believe that your DGD will love it and just think, you may have to make her another one. I have made one of my GDs 3 quilts and she is only 17. Remember...anything made with loving hands is always a loving gift and it doesn't have to be the last gift. I was making a rose of sharon quilt for my niece for her wedding. I have put in so many hours of work on that thing, I absolutely hate it! (I may make it into an applique murder quilt! )I made her another quilt the one that is my avatar. I think what you think is important. If you don't like it, send it to the salvation army, or give it to another quilter, maybe they can do something with it, or ask another quilter what you can do to save this quilt. We should have a subject heading that is for quilts in trouble! There are so many folks on this site that are really knowledgeable quilters. Take a picture of it and ask How do I save this quilt? This is a very good idea. Hope it works out for you. just a up date here. I did find the one for my grandaughters quilt man. It has taken a long time. I see a pic of one on a blog by the time I have the peace sign it was so big, But it is there still not liking it doing the quilt part now ran out of the thread lol run to walmark go one . It last me a day so going to put it up tell I get a order out. I made the tumbl block for my other grandaughter she is 4 that was a pain I wont to make them look like there falling no somthing a new be should be trying lol but it there. hope it better when the quilting get in it. We are very hard critics on our own quilts but it is WHO is getting the quilt that will be the final judge. If she is going to love it because you made it, that is ALL that is really important. Enjoy making the next one.